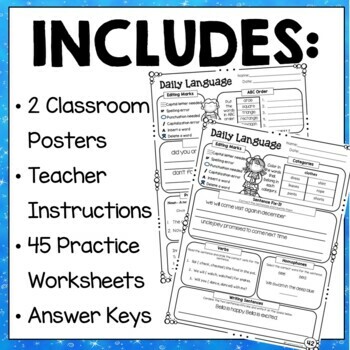 Daily Language Bundle. 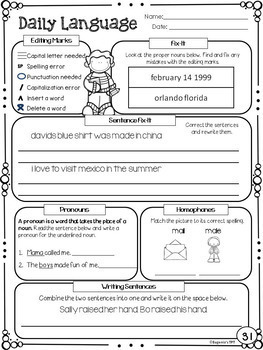 Created for first graders but a great review tool for second graders! 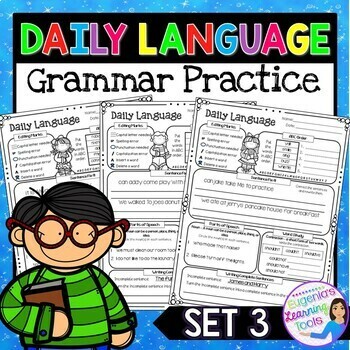 This is Set 3 of my best selling Daily Language Practice product. The fun and learning continues! I am a first grade teacher who has taught ELA in a departmentalized classroom for several years. Even though all we do in my classroom is focus on ELA, there never seems to be enough time in the world to review the concepts and skills that my little ones need. I needed something that keeps everything "fresh," so that they don't forget what they've learned. I have successfully implemented it this year with my little ones by using it as a classroom warm-up. 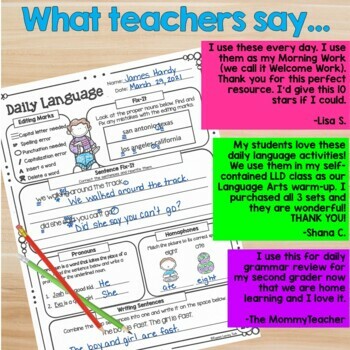 We all love it and best of all it keeps my kids reviewing and applying important language concepts and skills. I've also included a couple of posters that will help out for student reference. If you've purchased the other two daily grammar sets, these posters all match very nicely. Answers keys are attached as well, conveniently for those days with a substitute in the classroom. Make sure to check on the preview to get a better idea of what you'll be getting. Looking for the other sets of Daily Language? Here you go!